Which Scout should I invest? Hello! I got a legendary scout from a 15 radios call and since I already got a legendary scout, I was wondering which one I should invest my tokens in. I have one pretty much from the start of the game since I was a noob then . Anyway, here they are. As you can see, they both share three traits but differ in two. 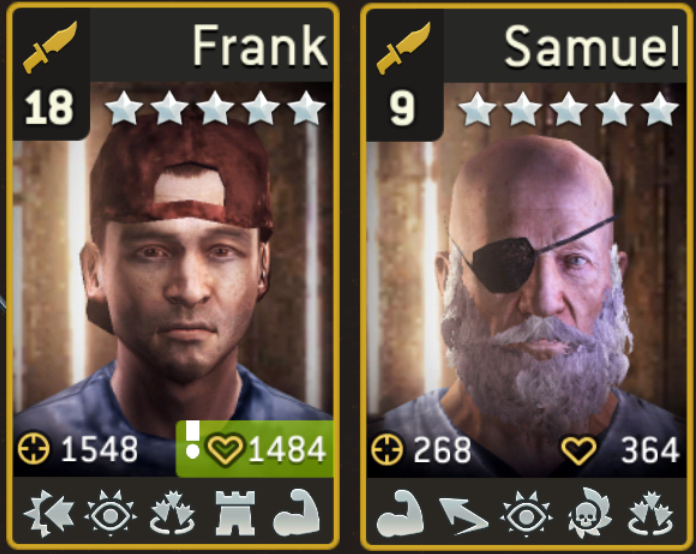 I am edging towards Samuel just because of the Dodge (and I also would get Ruthless which should be nice against those high level walkers) but I would trade in Frank's Retaliate and Defensive Stance. I am unsure what to do, since the traits I would get are nice but the traits I would trade in from Frank are also useful. Any suggestions? Maybe I could use one as an Outpost defender with some good equipment? EDIT: Samual has been retired, I got a new scout and now the same question applies. Scroll down for more info. Neither one is ideal but I would go with Frank. You can always find armor with the ruthless trait. Dodge would be nice but I'd rather have retaliate. Samuel has the cool factor with the eye patch though. Thank you for your answers. I decided to retire Samuel and keep Frank for now. However, I got another 4 star scout from a radio call. I hope I can keep this in the same thread, but if not, I'll start a new thread. This new scout has the following traits: Defensive Stance, Lucky, Power Strike and Vigilante. Defensive Stance and Vigilante together can be a powerful combo, right? Lucky is also a nice addition, though I am disappointed by the lack of Retaliate, but oh well. Even with this one, I still lean towards Frank. What do you think? @TheRie For scout, i would say retaliate, iron skin, strong(well, now you can replace that one with badges), luck and one of dodge/ruthless(I prefer ruthless, but dodge will do too). Im not very skilled with using power strike, but as far as I know, some ppl wont take scout/warrior class without. For now, you´ll have to work with what you have, but I would save tokens for future pull, that will be better.